The most expensive Samsung smartphone to date, the Galaxy Note 8 costs nearly $1,000 in the United States. However, there are other channels that you can use to get the flagship much cheaper if you're a Note fan. Although buying a new smartphone (and an expensive one) with less than a month ahead of Mobile World Congress (MWC) 2018 may not be the best idea, here is a deal that you might not want to skip if you absolutely must change your phone. 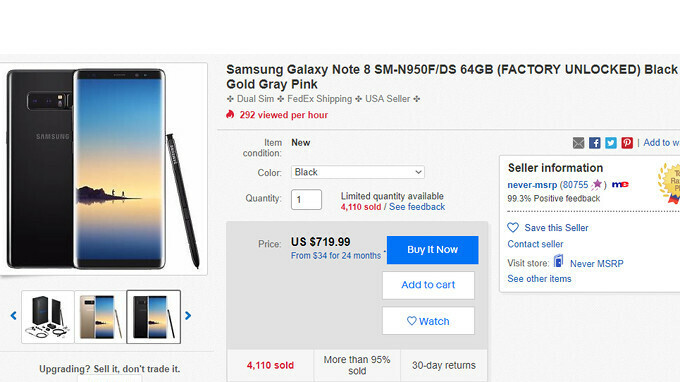 The unlocked Samsung Galaxy Note 8 is now available for purchase on eBay for just $720. Considering the flagship is selling at most US carriers for around $960, you'll be saving at least 25% from the MSRP. There's a catch though, as the unlocked Galaxy Note 8 will only work on GSM networks, so you won't be able to use it with carriers like Sprint and Verizon. Also, the black color version is the only one available for purchase and there's no free shipping offered. tempting.... but i think i can last a little longer with this axon 7!